The RockJock JK off road suspension system allows for efficient clearance of Up to 37 inch tall tires, with minor trimming, on any model of the 4 Door Jeep JK Wranglers. Kit allows for Up to 11 inches of rear wheel travel and 9 1/2 inches of front wheel travel when used with the recommended Shocks. Up to 11 inches of front travel is attainable when used with specific Shocks and some minor trimming to the vehicle. This kit is comprised of only the highest end components in the areas of strength, fit, finish, function, and the R and D testing to back them. 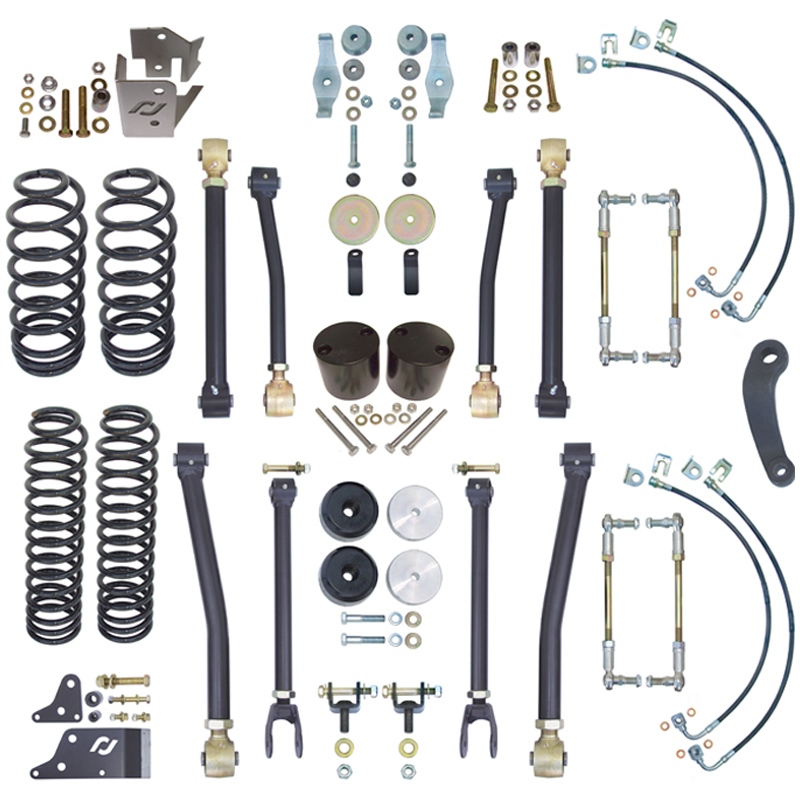 Included is the set of 8 Johnny Joint adjustable control arms, set of 4 progressively wound coil springs, front urethane bump stop kit, rear bump stop spacers, rear coil spring retaining kit, front D.O.T. approved stainless braided extended brake line kit, rear D.O.T. approved stainless braided extended brake line kit, front trac bar relocation kit, rear trac bar relocation kit, relocation kit for the tops of the front Shocks, relocation kit for the bottoms of the rear Shocks, front heim jointed adjustable sway bar links for use with the stock front sway bar, rear heim jointed adjustable sway bar extended links for use with the stock rear sway bar, and a dropped pitman arm. Note: 2012 and newer models will most likely require exhaust modifcations to allow for suspension down travel. OPTIONS NoteS: Shock options, sold seperately, are Rancho 9000X or 3 different styles of Walker Evans. Front and rear Johnny Joint trac bars available - see related items!